In the bygone era, also known as the other night, dinersaurs roamed The Island to fulfill their most basic biological need: food. Our prehistoric drama unfolds in the peaceful valley called The Gallery. From a distance, silhouettes of various sauropods are seen bobbing their heads in typical fashion of feeding. Thud. A Procompsognakid reared up alert, nostrils aflare. Thud. Zoom in to soup in a bowl rippling to the heavy footfalls. Thud. Cut to a tense crowd of Waiterodactyls hovering around their dining caves of employ. Thud. Cut to soup bowl. Thud. Pan down, up, zoom forward. ROOOOAAR! Behold the mighty Tryrannosaurus. Six feet of strapping male model muscle, intense eyes and a killer smile. Thriving on obscene amounts of protein, the saurian king walks into the valley in search for his next meal. Dinesaurs everywhere r̶a̶n̶ ̶f̶o̶r̶ ̶t̶h̶e̶i̶r̶ ̶l̶i̶v̶e̶s̶ went about their business like there was nothing to see. It could not have been more easy for this carnivore. 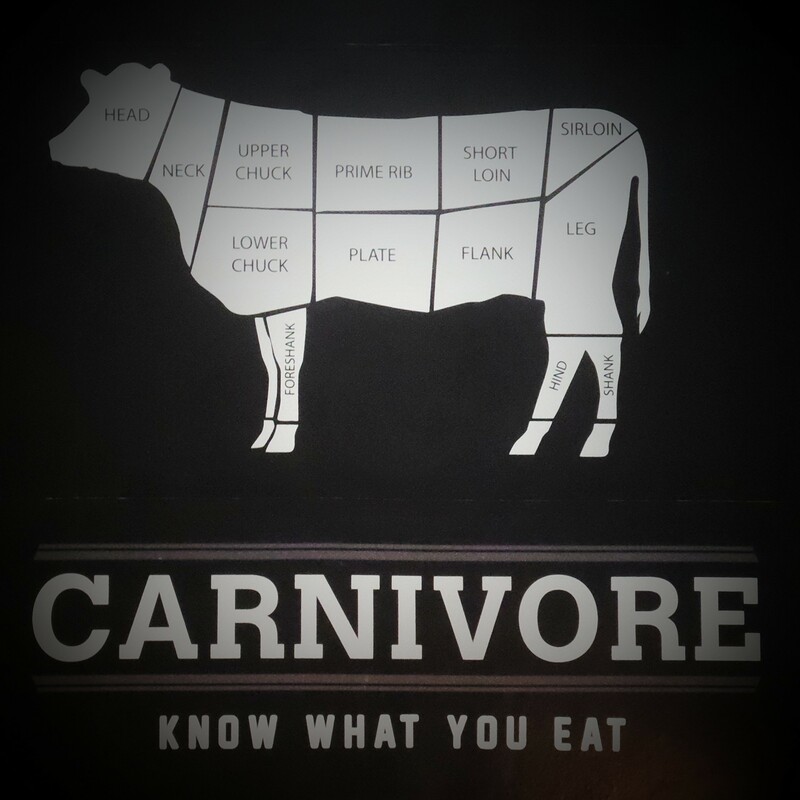 A white signage against a dark grey wall served as his idiot board: CARNIVORE. With a commensal in tow, the savagely beautiful Sabre-toothed PussyKat, he was welcomed into the stark, no-frills space. 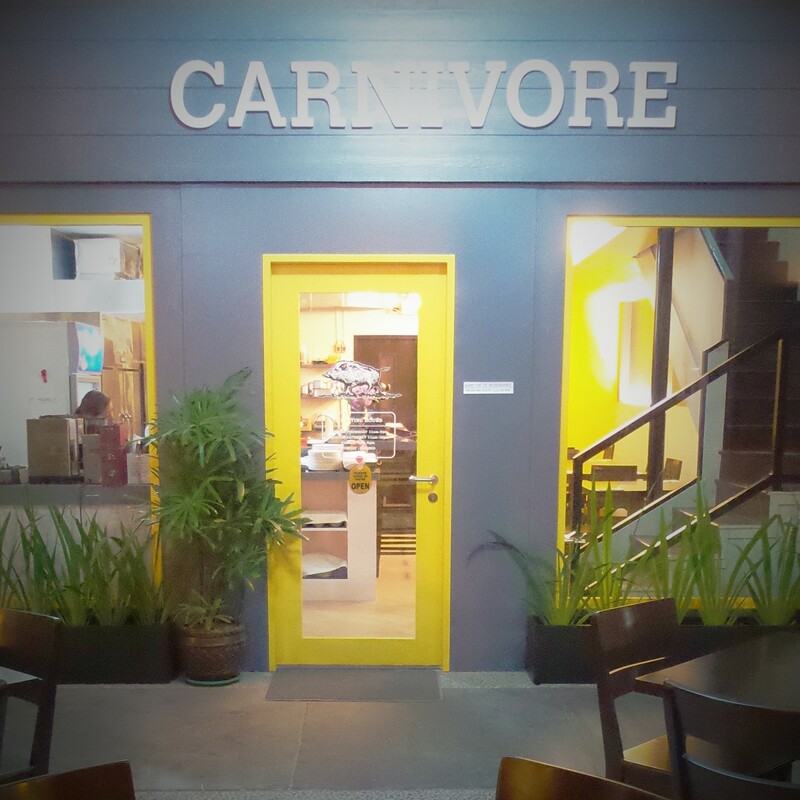 The same logotype, Carnivore, is echoed above a woodcut-syle illo of a wild boar on the glass door. A bar borders the open kitchen and grill space. Meat cut charts of animals adorn the mezz wall. The single-sheet menu was handed to us on the current de rigeur clipboard. Ever one for burgers, that was pretty much a no-brainier and we took the wrap from two- item sandwich section, as well. The cool nighttime weather allowed us to sit outdoors and there was not much wait time between ordering and the service. Our dishes were set in front of us with much caution for heated plates — a wonderful touch to help keep the food warm without going to the sizzling plate or stoneware extreme. This beast begins the feast with savage ferocity, his teeth ripping through the yielding buns of the Carnivore Burger. A strong but welcome bite from the mustard went well with the zippy, fresh greenness of the locally-sourced (Lilo-an) Romaine lettuce. 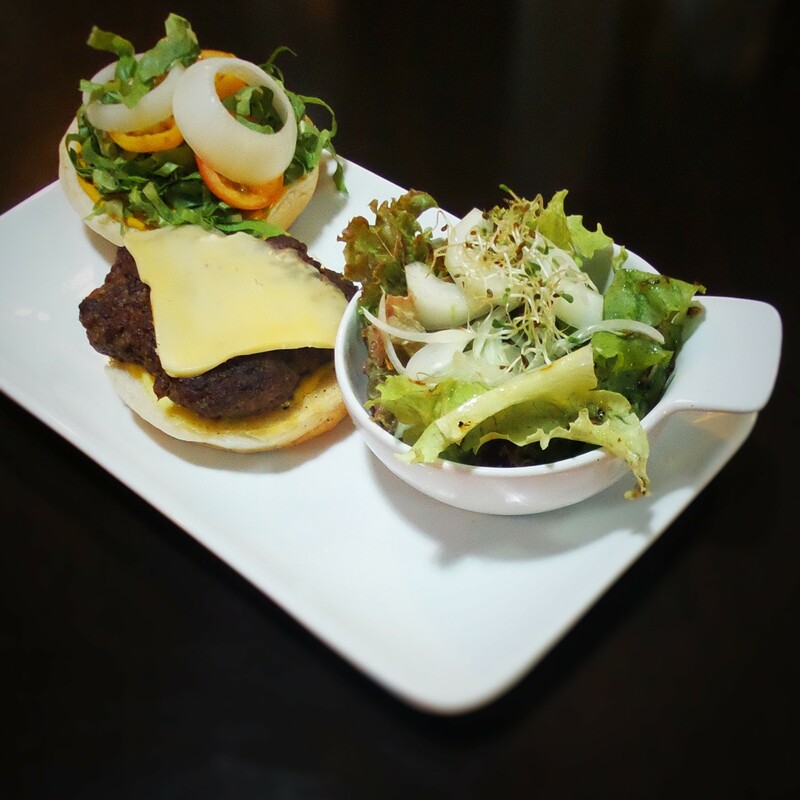 Fresh, red tomatoes and white onions added some acid and pungency to the mouthful before giving way to the lightly house-smoked Cheddar cheese and the perfectly well done Bukidnon Kitayama Wagyu and US Angus beef patty. Noticeably fresh lettuce, cucumbers and alfalfa sprouts were showered with a light vinaigrette in the House Salad, a rather generous side. A low, feral growl coming from the Sabre-toothed PussyKat indicated she wanted in on the feeding frenzy. The Tryrannosaur’s offer of a bite appealed to the domesticated feline side and was returned with half her food nudged in his direction. 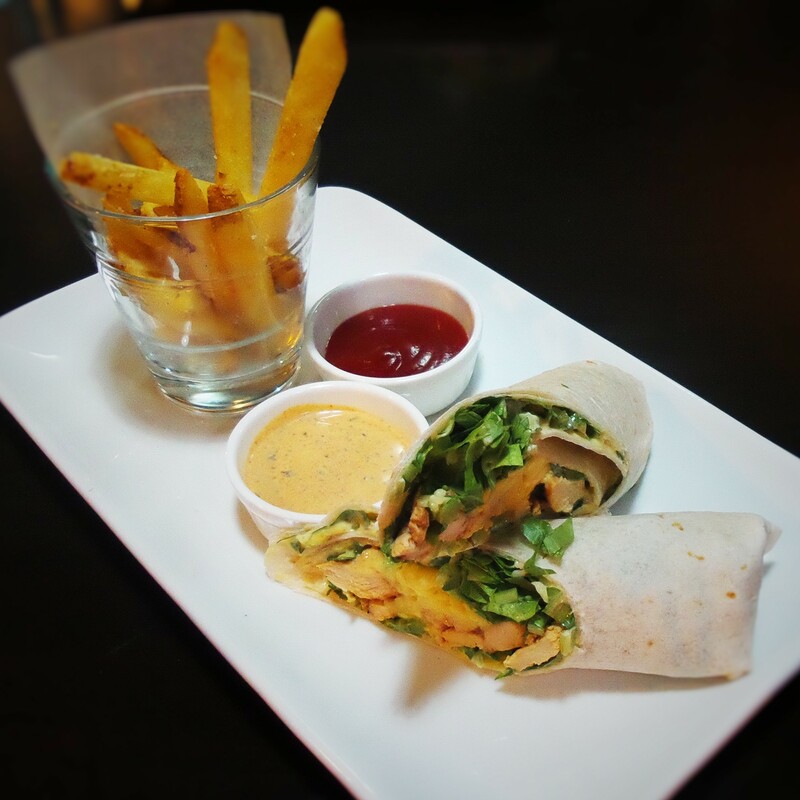 Seared then oven-finished marinated chicken breast simply slapped with home-made Garlic Aioli, rolled up in a flour wrap with some organic greens made the Wrap. The noticeably fresh greens, again, played off that strength for a veggie counterbalance to the lightly savory chicken. A home-made Ranch dressing with strong herb notes gives Kraft a run for its money. Crispy, reg-cut fries with skins on kept the whole thing from crossing over to dark side called health food. Seeing the beasts quite satisfied, the humans emerged to exchange pleasantries. On-board items and future offerings discussed already made their mouths water for the next feeding. Their wild boar logo explained, the promise of more exotic meats and preparations have made the Sabre-toothed PussyKat mark Carnivore on our feeding list. Talks of cutting back on carbs and intermittent fasting were thrown around while slinking out of The Gallery. “So . . . we’re not doing KFC or Dimsum for a while, huh?”, the Tryrannosaur asks. *SHINKT! * The Sabre-toothed PussyKat’s claws unsheathed and the Tryrannosaur blacked out. This entry was posted in Uncategorized and tagged beef, burgers, carnivore, Cheddar cheese, Chicken, Food, foodporn cebu, hamburger, hamburgero, the gallery. Bookmark the permalink.